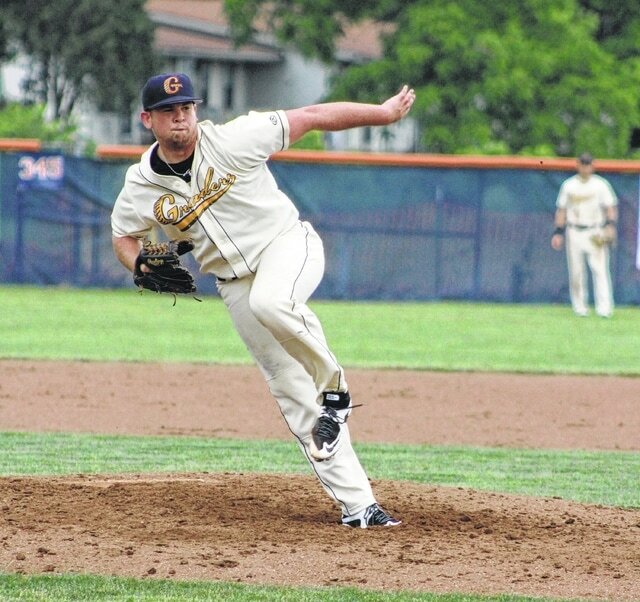 Galion pitcher Will Ore picked up the win on Thursday as the Graders defeated the Hamilton Joes, 6-0. The game was shortened to six innings due to severe weather that left the field soggy. GALION — It’s been said that good teams make their own luck. It’s also been said that sometimes it’s better to be lucky than good. The Galion Graders enjoyed an equal measure of both in a 6-0 victory over the Hamilton Joes on Thursday evening at James D. Heddleson Feld at Heise Park. “The baseball gods shined upon us, not Mother Nature,” said Graders head coach Ray Neill in the wake of the unusual win. The Graders (4-6) benefited from a Great Lakes Summer Collegiate League rule that says that in the case of a game that is halted due to weather or other reason, the final score of the game is determined by the last complete inning that is played. In the case of Thursday’s game, Galion led 6-0 at the end of six complete innings of play, but Hamilton rallied to tie the game in the top of the seventh inning. However, before the Graders could send a batter to the plate in the home half of the seventh, the game was delayed due to lightning in the area, and, after a lengthy stoppage complete with heavy rain that soaked the playing surface, was eventually called off by the umpires. With the seventh frame incomplete, the final score was based on the sixth inning. It was a tough way for the Joes to lose after the outstanding comeback they mounted in the seventh. Galion starter Will Ore ended up earning the win. His final official statistics will show a two-hit shutout with four strikeouts and no walks. Ore is now 2-1 this season. In the seventh frame that was erased, Hamilton (6-5) scored four runs off of Ore and added two more off reliever Ben Hamilton, including a solo home run by R.J. Thompson that tied the score at 6-6. Officially, Hamilton’s Hunter Owen was the lone Joe to record hits. He went 2-for-2 with a double in the fifth inning. J.T. Core and Hunter Clanin each drove in two runs to pace the Galion offense. Mark Delas and Aaron Caputo each had a RBI. Lead-off hitter Nicholas Riotto went 1-for-3, scored twice and stole two bases. Mark Walton finished 2-for-3 and scored a run. Delas, Clanin and Tyler Ocker each scored one run. After Ore retired Hamilton in order in the top of the first, Galion wasted no time opening the scoring. The Graders plated three runs in the first inning as Delas slapped a single through the left side of the infield to drive in Riotto with the game’s first run. Clanin later ripped a two-out triple to right centerfield that drove in Ocker and Delas. Ore retired three of the four batters he faced in the second inning, and the Galion bats went back to work. Walton and Riotto each singled and scored on an error that allowed Core to reach base as Galion extended its lead to 5-0. Ore pitched a perfect top of the third to keep his shutout intact. Meanwhile, the Graders added their final run in the home half of the third after Clanin drew a one-out walk and scored on a long single to centerfield by Caputo. Ore struck out two of the three batters he faced in the fourth, retired three of the four Joes who came to plate in the fifth and got three fly-ball outs in the sixth. With the clean sheet, Ore’s earned run average dropped to 2.45. Hamilton’s Tristan Hammans was the losing pitcher. He gave up six runs on six hits in five innings of work. Hammans walked three batters. Galion and Hamilton are scheduled to play at 5:35 p.m. on Friday at Heise Park.